The same straightforward, step-by-step writing that made the Legal Writing Handbook enormously popular is here, in Just Briefs, Third Edition. 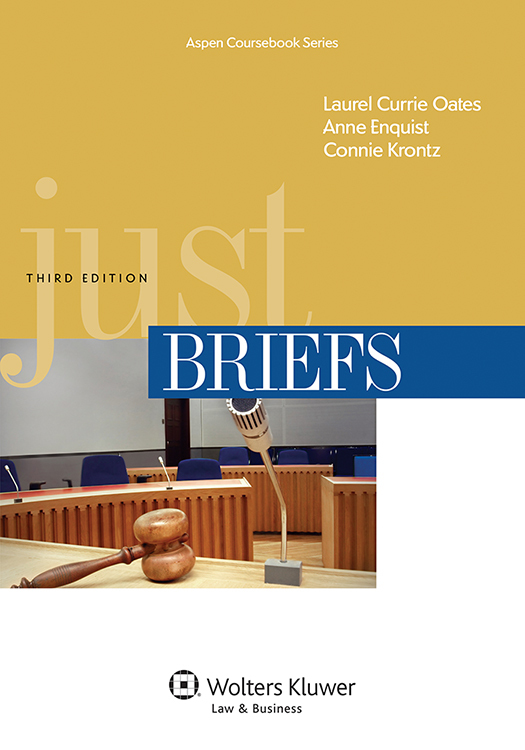 This concise treatment of brief-writing focuses on pretrial motion and appellate briefs, as well as oral arguments in trial and appellate courts. Here, you’ll find helpful examples of trial and appellate briefs, and a guided tour of the unique process of writing a brief. The Third Edition features updated coverage of motion briefs, including a new example that uses a brief in support of a motion for summary judgment. Professor Enquist has been a member of the legal writing faculty and the Writing Advisor at Seattle University School of Law since 1980. She serves as the Director of Seattle University's nationally ranked legal writing program. As the Writing Advisor, she works one-on-one with law students on their legal writing. She is the co-author of five books and the author of numerous articles about legal writing. She has served on the national Board of Directors for the Legal Writing Institute, and in 2007, she received the American Association of Law School's Legal Writing Section Award. In 2014 she received the William Burton Award for Legal Writing Education. Her research and scholarly interests concern all areas of legal writing, particularly diagnosing student writing ability, critiquing law students' writing, and writing issues that affect ESL law students. Laurel Currie Oates is a professor of law at Seattle University School of Law and has been the director of Seattle University’s Legal Writing Program since 1984. With Professor Anne Enquist, Professor Oates has authored five books on legal writing: The Legal Writing Handbook, which is in its fifth edition, and Just Research, Just Memos, Just Briefs, and Just Writing, which are in the fourth edition. Professor Oates has also authored numerous law review articles, including articles on legal reading, writing to learn, the transfer of learning, and the outsourcing of legal work. Professor Oates is also one of the co-founders of both the Legal Writing Institute and APPEAL, an organization that provides opportunities for academics in Africa and the United States to share ideas about helping students, lawyers, advocates, and judges improve their writing. During the last five years, Professor Oates has worked in Uganda, South Africa, Kenya, Afghanistan, and India, providing workshops on effective writing. In June 2007, Professor Oates received the Burton Award for Outstanding Contributions to Legal Writing Education at the Library of Congress in Washington D.C., and this year she received the Marjorie Rombauer award from the Association of Legal Writing Directors.